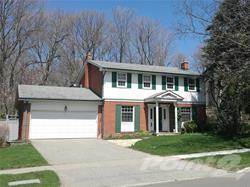 Backing On To A Beautiful Ravine This 2900 Sf Executive Home Has A Spacious Main Floor Family Room Plus A Sun Room Addition, Bringing The Outside In!. The Lower Level Is Over 1600 Sf With A Walk Up. Extra Features: 200 Amps, Cvac, Updated Windows & M/F Laundry.This Home Has Tremendous Potential. *** Over 4500 Sf Of Living Space. *** Table Land And Ravine. ***Location Is A "10" With Schools, Ttc, The 401/D V P, And Shops All Within Walking Distance. Hi, I'd like to find out more information about 128 Cassandra Blvd. Thanks so much!